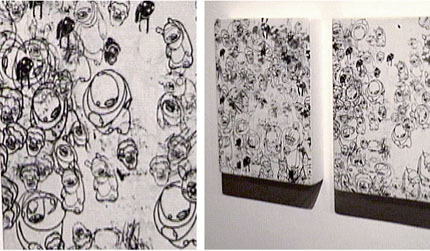 Drawing Attention is a group exhibition of drawing-based works being held at Toronto’s Spin Gallery from January 10th to February 2nd. The show is curated by Juno Youn and features work by over 20 artistsfrom Canada, Mexico, El Salvador, Korea, Scotland and the USA. There are some very interesting pieces, and I found the show to be well rounded cross-section of fresh new work. Featured Artists: Si Si Peneloza, Laurel MacMillan, Christopher Lori, Christopher Hutsul, Michael Caines, Kojo Griffin, Min Kim, Scott McEwan, Jeremy Laing, Benoît Saito, Misakiu, Matt Bahen, Ron Ackroyd, Paula Coop, Jason Van Horne, Lucie Chan, Oscar Camilo De Las Flores, Michael Toke, Sung -Ja Kim, Mario Doucette, Derrick Hodgson, Christopher Arnoldin, Shary Boyle, Daryl Vocat, Gerado Yepiz/ Acomonchi, Mark Clintberg. I was drawn to the show to see some recent work by my good friend Derrick Hodgson. Hodgson’s drawing based paintings are beautifully rendered, multi-layered works crawling with the energy of his many characters/creatures. Hodgson graduated from the Ontario College of Art in 1996 having studied in the Communication and Design and Printmaking/Bookarts departments. In 1999 Derrick started MDRL creative, developing projects in Illustration, Design, and Animation and a project called Hoboyard Toy Collective where his drawings come to life as stuffed toys. Hodgson’s work has been seen all over the world, including multiple times in Japan.